The Strengths and Difficulties Questionnaire (SDQ) is a widely used child mental health questionnaire with five hypothesised subscales. 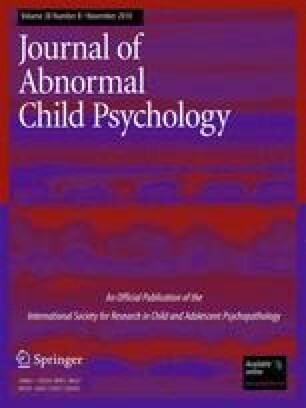 There is theoretical and preliminary empirical support for combining the SDQ’s hypothesised emotional and peer subscales into an ‘internalizing’ subscale and the hypothesised behavioral and hyperactivity subscales into an ‘externalizing’ subscale (alongside the fifth prosocial subscale). We examine this using parent, teacher and youth SDQ data from a representative sample of 5–16 year olds in Britain (N = 18,222). Factor analyses generally supported second-order internalizing and externalizing factors, and the internalizing and externalizing subscales showed good convergent and discriminant validity across informants and with respect to clinical disorder. By contrast, discriminant validity was poorer between the emotional and peer subscales and between the behavioral, hyperactivity and prosocial subscales. This applied particularly to children with low scores on those subscales. We conclude that there are advantages to using the broader internalizing and externalizing SDQ subscales for analyses in low-risk samples, while retaining all five subscales when screening for disorder. AG is a director of Youthinmind, which provides no-cost and low-cost software and web sites related to the SDQ and the DAWBA.